- All fill materials possible, e.g. natural bristles and hair, plant fibres and synthetic filaments. - As backing material we use galvanised steel and stainless steel (1.4301, 1.4571) tapes. - The same possibilities are available for the production of strip brushes in arch form however not only in semi circles but also in other pitch forms. The larger the dimensions the better multiple brush segments can be mounted around the perimeter. 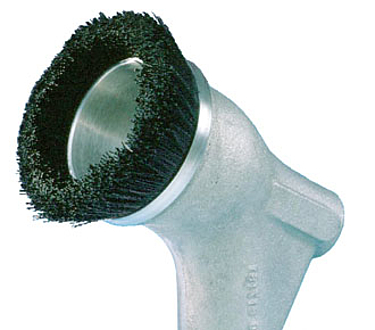 Besides the cup form the strip brush can be bent in any other form.